The Honda HR-V boasts space and practicality which can be explored at Mekor Honda Canal Walk. 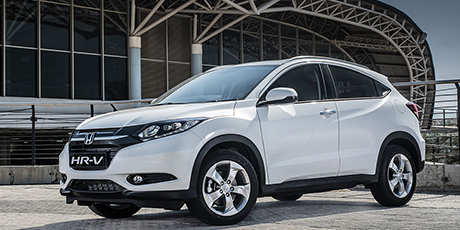 The sleek and sporty exterior gives the Honda HR-V an aerodynamic look and a fierce personality. The spacious interior features Honda’s unique Magic Seat System which allows for a variety of seating and load carrying options, ensuring first class versatility. The sophisticated infotainment system features extensive additional functionality depending on the variant, including hands-free telephone and audio system, USB and HDMI connectivity and smart device screen mirroring. Driving the Honda HR-V is safer than ever before with parking sensors and a rear-view camera. The Honda HR-V is powered by a 1.8L four-cylinder engine with 141-horsepower. For a SUV that has a sleek style as well as immense practicality, visit Mekor Honda at Mekor Honda Canal Walk for Cape Town, Milnerton and the Cape West Coast to get your hands on the Honda HR-V.